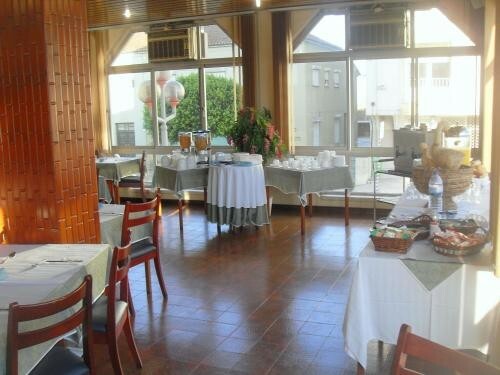 Situated in the historic town of Mafra this small hotel with 24 comfortable bedrooms is a good base to view the National Palace. Discount rates online. Located in the interesting historic town of Mafra with its wonderful National Palace, the Hotel Castelão offers only 24 bedrooms as accommodation, a restaurant and a bar. All rooms have air-conditioning, TV, telephone and minibar. Room service is also available. Breakfast, which is included in the room rate, is served every morning. Later on you can enjoy local cuisine at the restaurant and relax at the bar with your favourite drink. Services such as airport shuttle, laundry and car rental have been designed to take the hassle out of your stay. The seaside town of Ericeira, a popular resort and surfing destination, is only a distance of 13 kms, and Lisbon city centre is 35 kms.